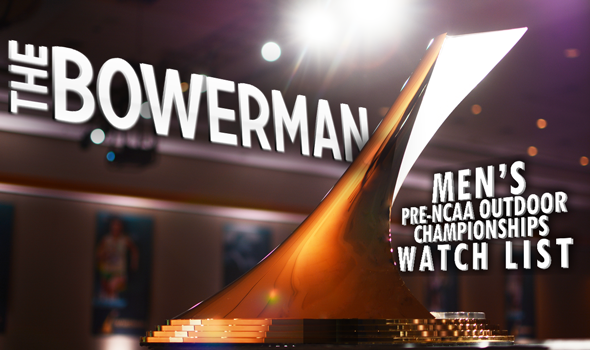 EUGENE, Oregon – For the past four weeks, the same 12 men have dominated the conversation when it comes to who is the most deserving of The Bowerman – the highest individual honor in collegiate track & field. It’s only right those same men step up the most in crunch time. And with the collegiate track & field season drawing to a close this week at Historic Hayward Field with the 2017 NCAA Division I Outdoor Track & Field Championships, it’s time to unveil the Pre-NCAA Outdoor Championship Watch List as it was released on Monday by the U.S. Track & Field and Cross Country Coaches Association (USTFCCCA). Nothing changed from the Pre-NCAA Prelims Watch List that was released a few weeks ago. Also Receiving Votes: KeAndre Bates (Florida), Byron Robinson (Texas). Edward Cheserek, Christian Coleman, Mostafa Hassan, Fred Kerley, Josh Kerr, Emmanuel Korir, Ioannis Kyriazis, Chris Nilsen, Lindon Victor and Devon Williams still grace the 10-man index with KeAndre Bates and Byron Robinson also receiving votes. Despite seeing his collegiate career come to a close, Cheserek pushed his all-time record for career Watch List appearances to 29. Cheserek couldn’t compete at the NCAA West Preliminary Rounds due to a lower back injury, which meant he wouldn’t be able to qualify for NCAAs. That in turn unceremoniously wrapped up his time as an Oregon Duck. Cheserek ended his final year with a pair of NCAA titles (both indoor) and a collegiate indoor record to his name (mile). Coleman kept up his blistering pace on the track at the NCAA East Preliminary Round. The Tennessee junior clocked the 2nd fastest time in collegiate outdoor history over 200 meters (19.85) and lowered his season PB to 9.96 in the 100. Coleman will contest both the 100 and 200 at NCAAs and hopes to become the first man to sweep the indoor-outdoor sprint titles since former Tennessee great Justin Gatlin. Hassan continued his undefeated season in the shot put, recording the best throw in Austin, Texas, two weeks ago. The Colorado State junior will hope to complete the indoor-outdoor sweep in that event this week. Kerley turned in a historic performance at the NCAA West Prelims. The Texas A&M senior shattered Quincy Watts’ 25-year-old collegiate outdoor record in the 400 as he crossed the finish line in 43.70, well ahead of Watts’ old standard of 44.00. Kerley now owns the No. 1, No. 3 and No. 9 spots on the all-time chart in the outdoor quarter mile. He is entered in the 400, 4×400 and 4×100 this week at NCAAs. Kerr finished runner-up at the NCAA West Prelims in the 1500 and hasn’t run faster than 3:46.39 over that distance since the Bryan Clay Invitational. The New Mexico sophomore hopes to complete the indoor mile-outdoor 1500 double in Eugene. Korir turned in a dazzling effort at the NCAA West Prelims in both the 800 and 4×400. The UTEP freshman clocked a time of 1:45.88 to win the 800 and split a time of 43.34 on the anchor leg to help the Miners qualify for NCAAs in that relay. Kyriazis once again only needed one throw to capture an event title. The Texas A&M junior had a quick day at the NCAA West Prelims and goes into NCAAs in Eugene having only thrown the javelin three times in competition. His first throw of the season was a doozy as it still stands as the 2nd best mark in collegiate history. Nilsen enters NCAAs as the top-ranked pole vaulter in the nation and could become the 1st male freshman in NCAA history to win the DI indoor-outdoor titles. Victor should be well rested and prepared for his quest to notch back-to-back decathlon titles at the NCAA meet. This year has been special for Victor as he broke the collegiate decathlon record and later improved upon that mark at the SEC Championships. This was Victor’s 10th career Watch List appearance, making him one of 14 men to accomplish that feat. Williams is Victor’s toughest competition as he enters NCAAs with the 9th best score in collegiate history in the decathlon. The Georgia senior won the heptathlon title during the indoor season and would love to complete the sweep.